Lol!!! David!!! Codys antics are funny! Skimble was also chasing a spider this evening.. he's also eaten a bumble bee and a butterfly. I'm sure my cat would do the exact same thing if I let him outside. But he's an indoor cat. He never goes outside. But last winter when I had my mouse problem, he would sometimes catch a mouse and then run upstairs to my bedroom and drop the mouse on my pillow. And just like Skimble, he will be purring very loudly when he does it. He's very proud of himself. We can't get angry though when our cats do things like this. Hunting is in their nature. But GAWD it's disgusting when it happens! When I would have a mouse (usually in the winter) the cat would eat the half with the head and leave the body half for me to "find" so that I could be proud of her. YES!!! Very disgusting!! Dobie, I always use the 4th option under the picture on photobucket; the one that says IMG Code. If you copy the code from the box and paste it into your BetterMost message, it should appear without any problems! 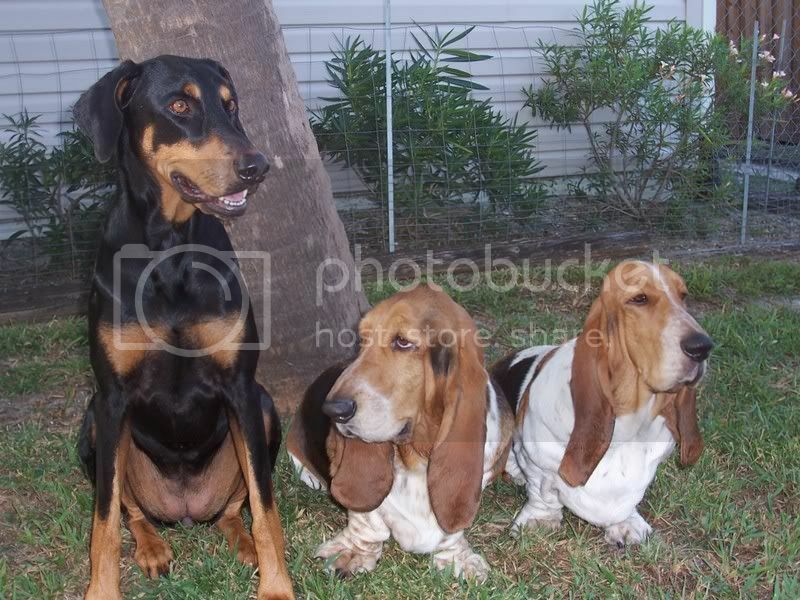 Dobie, your dogs are absolutely beautiful! David, thanks for taking the time to post one of the photos in this thread. Oh David, thank you so much for putting my "kids" pictures up here! I tried last night for a long time to get them in the message box, but couldn't! I appreciate it! Their names are, from left to right: Demi, Crusher and Murphy. All certified therapy dogs, and the loves of my life! Thanks for your kind comments Fran! Aren't dogs wonderful? What would we do without them? Did I explain it to you clearly? Sometimes I'm not very good at explaining things. If you have any further questions, please send me a pm and I'll try to help you with your pictures in any way I can. I only posted that picture as an example, to show you that your pictures are already properly set up in your photobucket album. The other three pictures are all ready to be posted here too! Just copy the IMG Code and paste it in here. Once you've done that, I can go back and delete the picture I posted in my message. Just let me know if you want me to do that, okay? Those are such cute pictures! You have some beautiful animals Dobie!! Thanks David. I'll try it to see if it works for me. Do you know if the pictures can be made to appear smaller than the size that appears in your message? Then I could post more than one of them here and not take up a bunch of space. Do you know if the pictures can be made to appear smaller than the size that appears in your message? Dobie, you can play around with the height and the width measurements. It's easy. I'll use your photo that was posted by David as an example. As I said, you can change the width or the height to get a whole range of different sizes. It might be easier for you to understand this if you click on "quote" in the upper right-hand corner of this post, so you can see the IMG coding I'm talking about. BTW, larger photos can be nice, too. The size David posted looks great! I have three cats that stay indoors. I also have two dogs. But, for whatever reason - birds have chosen to fly in to my house - twice! One of the cats cornered a bird once - I thought it was dead - but no flew up in my face when I went near. I managed to get the cats out of the room and out the bird flew. The second time another bird somehow got stuck in the basement (long story) - I managed to get the bird out of the house quickly and undetected by the cats.